Excellent feel to this helmet as soon as you put it on . Nice to see it come with the pin lock . Good ventilation too. 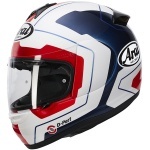 Arai quality, very comfortable, looks great with a dark visor, super fast delivery as always. Very comfortable but the helmet had no pinlock or draft skirt. I should have checked but if you add the cost of the extras then it comes close to more expensive arias and other helmets. I like the feel and wide view but i think I will get the chaser x.
I had to exchange this for another HJC lid.! And the team were amazing not only helpful and informative they turned round the exchange in 24 hours! Great company and great lid.! Perfect fit no wind noise! Vision is perfect and lining comfortably! Highly recommended and great price!! This is my fourth Arai over the last few years & by easiest the best fit so far, not as light as some but still a quality product. 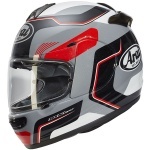 This latest purchase is my third Arai Axces and the second Axces 3. I had a crash from about 50mph and slid down the road wearing my last one. I skidded face down for sometime too and the helmet truly did it's job very well. I wouldn't wear anything else now. In addition to protecting my head in my crash I find the Axces 3 incredibly comfortable even riding all day. I also find it very quiet. I do always wear ear plugs but it is quiet and I've never got any buffeting using it on a sports bike. It feels like a quality helmet both wearing it and holding it. Another great feature of the Axces is that unlike other helmets it doesn't give a huge amount after wearing it from new for a few weeks. Other helmets I've had go from being a good fit when new to too loose after a few weeks, not so with the Axces 3 it remains a good fit. The only thing I can fault Arai on is the visor removal. No matter how many times I try, changing Arai visors is frustrating! Overall though an excellent helmet and as ever excellent service from Sportsbikeshop. I like the way they send them in a big box too; gives some assurance they aren't damaged in transit and is one reasons I always buy from them. This is the second Arai Axces that I've owned. There are noticeable improvements for the Axces 3. It's comfortable, plush, well made, well ventilated, the visibility out the wide visor window is great. It's small outer shell keeps things looking tidy and light. The contours for improved airflow are effective at high speed. It's not the most exciting purchase you will make. 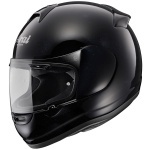 When you start riding you forget about this helmet, which is exactly what you want a helmet to do, it isn't distracting in any way allowing you, the rider, to concentrate on riding and the road conditions. It's standard, it just works, and it works well. If you are looking to make a fashion statement with your helmet, this isn't the helmet for you, and from one rider to another, I'd recommend not focusing on how your gear makes you look, and rather on what it does for you and how well it's doing it. Extremely great fit. Low noise and very comfortable. Great quality and a really good price. Comfortable with a good design, better than my Bell helmet I had previously. Having had a selection of helmets over the years (HJC, Arai, Schuberth), I think the quality of this entry level Arai exceeds the others by a mile. The lining is great, the visor vents are a clever idea (supplemented with a Pinlock) and the paint quality and overall finish is superb. Recommend. I really like the plain and simple design of this helmet. Fit and finish is great. And for me it's very plush and comfortable but that doesn't mean that it's not snug. It doesn't move on my head so the fit in my case is just perfect, no pressure points whatsoever. The only 'downside' is that it's a little heavier than similar helmets. I tried on a lot of different helmets in the last couple of weeks but none suited my head better. I normally wear size M. Shoei, Shark, HJC, X-Lite also fit my head in size normally so if that's the case with you too, than this helmet should fit just fine. And I have to say that Sportsbikeshop has the best packet tracking I've ever come across. I ordered Friday evening, the packet left their house on Saturday and Thursday morning I received it here in Hungary. Hats off! 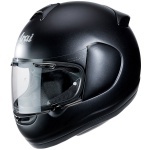 Excellent Helmet - needs to have a Pinlock visor in to be used in this weather as it steams up very quickly. Actually this helmet has a glossy finish with glitter like effect. Looks awesome. Having just had an AGV for 5 years it's a lovely change. Comfort is great, overall vision is good. I would say it tends to fog up more than previous helmets I've owned so a Pinlock in quite necessary. But build quality look and ventilation are perfect. Highly recommended.